Are you tired of blogging to yourself? Would you like to bring your blog to a new level? 1. It’s highly efficient when it comes to traffic and social media shares (sometimes on-page engagement too). I’ve been working for some major online outlets that have been flourishing thanks to news coverage. In my experience, evergreen and how-to content drives more references, trust and loyalty. While newsworthy articles drive regular traffic spikes that are easier to monetize (those are usually new visitors who are better ad-clickers). Maintaining consistency while not losing your voice. Covering news is a hard work. Plus, many bloggers have unique styles and news coverage is not easy to blend into the editorial calendar without annoying some of the most valuable loyal readers. Standing out. So many blogs cover news in so many ways that it’s easy to be “just another blog that talks about the news just because it happened”. How can you stand out in that clutter? So keeping #1 in mind and addressing #2, how can bloggers cover industry news while still being awesome? So trend-tracking comes first. 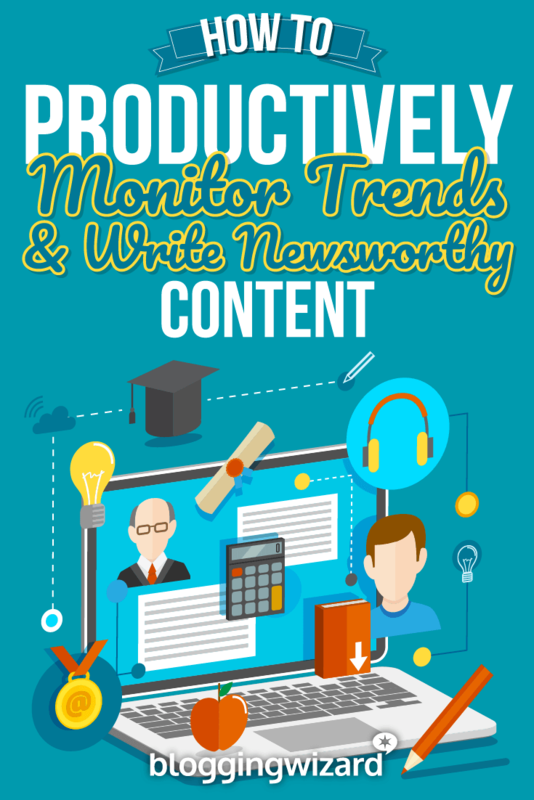 Monitoring trends and news is a good idea even if you are not going to blog about it. Being among the first to share the news with your social media listeners will pay off fast (in terms of increased engagement and following), so it’s a good idea to monitor news in your industry even if you are not planning to blog about it. Now, trend monitoring is harder than it sounds. How do you keep up with the industry while still being able to work and keep sanity? Coming from a news-heavy industry, I did manage to ultimately create my frugal approach to trend tracking. What I like about Twitter is that (even with all the clutter and spam), it is so flexible that you are in 100% control of what you see and how often. 1. Create a Twitter list of accounts that you know deliver hot news as they happen in your industry. Don’t add too many here: It’s best to keep it under 10 accounts to avoid clutter. It took me a few months of adding, removing, adding others before I got the perfect Twitter list. 2. 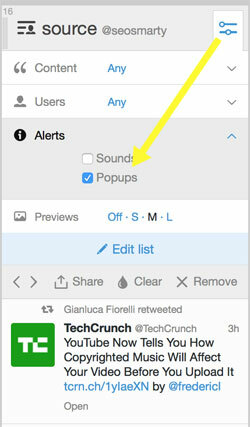 Set up a separate column in Tweetdeck (I believe you can use Hootsuite for that as well) and if you did a good job in #1, you are now able to activate pop-up alerts for this column. Now, newsworthy updates are delivered to my desktop and I can keep an eye on it without ever stopping my work. Productivity! All or any of that activity benefits my site and my personal brand in the long run. I am using hashtags to monitor trends in my industry as well but there are too many hashtags to try to keep up with them in real time, so I’ve created a separate dashboard using Cyfe to archive Twitter hashtag feeds for later (regular) reference. Cyfe is perfect for me because it can monitor the unlimited number of Twitter search results and it gives me that bird’s view of all the results on one page. You can track Google Plus hashtags on the same page too. I usually open my Cyfe dashboard only when I am getting down to writing to get more ideas and inspiration. This is somewhat self-explanatory. If you are not the first to ever break the news, you can get away by providing your personal spin. Humor usually goes a long way. One priceless tip I’ve discovered over time is reading through existing coverage while paying more attention to comments. In most cases, what people discuss in the comments sparkle my inspiration in no time. If you can’t be humorous or original (or you have no opinion yet or you are afraid of being controversial or you want to try something different), invite experts to share their opinion on the news that just happened. I tried that a few times and these types of articles get shared like crazy (because mentioned experts usually join in to share the piece around as well!). Group expert interviews are also a great way to build relationships with niche thought leaders. Reaching out to the subject matter experts in your niche, asking for a quick quote is a good way to collect some unique insights but probably not the fastest as experts will be sending replies for a few days, if not weeks. That’s why I usually keep this method to create news follow-ups rather than breaking news coverage articles. I also recommend using HARO (they support time-sensitive requests and even tweet them from their official Twitter account). MyBlogU (disclaimer: I am the founder) is the quickest (and I’d like to hope, the handiest) way to collect opinions and quotes from real people. Another way to drive more exposure is to make your news coverage more indepth and useful by providing background information. I like Jennifer Slegg’s style; she always cites more than one source, quotes experts, etc. I guess this is a more time-consuming approach but it may fit some blogs better. This is historically my favorite tip. I have a confession: I don’t do well with words. I have to think hard about each of them trying to articulate what I know and feel. Maybe that’s because English is my second language and I don’t even speak it too well. I’ve been blogging for 8 years and whenever I am at a loss of words, I use an image or a comparison chart. That’s how I got known in my industry. Not many people visualized as much as I did 8 years ago. I found my own way to write blog posts and that’s what I recommend doing. 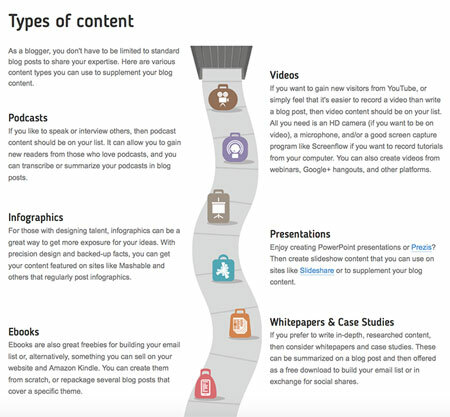 First Site Guide lists some possible ways you can (re-)package your (newsworthy) content. Twitter chats: Hosting a Twitter chat to discuss big industry news is a genius idea. Here’s how we create articles after the Twitter chats. But that’s not the only way to re-package a Twitter chat. Here’s an example of an infographic you can come up with after the chat. You can also create video round-ups (here’s an example). The more media you come up, the more channels you’ll be able to cater to. Here’s some more information on content re-packaging. Embedded Content: I like what Ana Hoffman does. Throughout the week she discusses industry news on Google Plus and collates them into a weekly round-up. This tactic builds up your blog and your social media profiles! You can read more about using embedded media here. This is a shorter tip but one not to miss – Always locate the original source and reference it. And link to everyone else whose coverage you liked. Don’t be afraid of spreading link love! Then tag everyone you linked to in social media updates. View the original presentation on Slideshare. 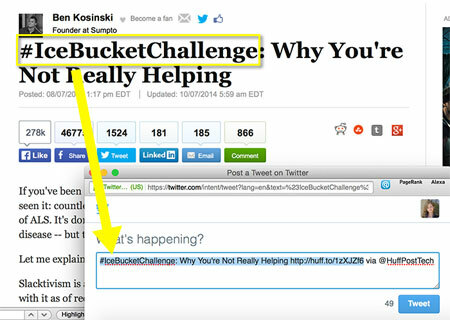 I did a detailed article on how I discover related hashtags here. 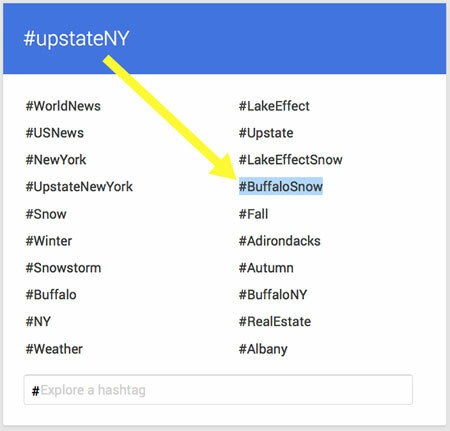 If you are covering local news, for example, you can discover trending hashtags by simply searching for your location in Google Plus /Explore section. Likewise you can discover similar hashtags, official hashtags, slang hashtags, etc to expand your reach to more channels. If you are covering an event or a specific trend, using the “official” hashtag in the article title is a great way to earn natural shares and more recognition. Being on top of industry news works great both for establishing your social media presence and building up your site traffic. Twitter is still best to track real-time news. Tweetdeck is great for spotting the news and interacting with it productively. 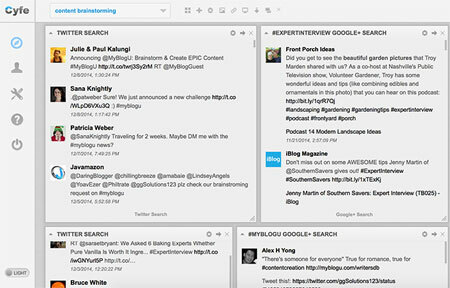 Cyfe is great for collecting and archiving lots of combinations of related Twitter search results. If you lack the time to write a blog post, consider inviting subject matter experts to share their opinions on the news. This often results in a lot of social media traction. 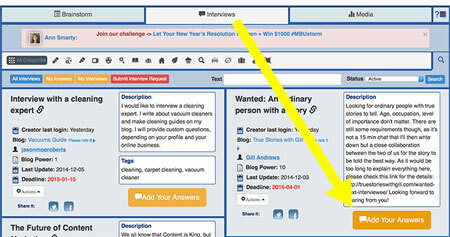 You can use MyBlogU or HARO to easily collect expert quotes. You can start the discussion outside of your blog and then create a blog round-up using embedded content or different types of media. Brand your news column consistently, stick to one format, experiment with different ways to re-package the news to reach wider audience. Linking out and social-media-tagging attracts (influential) bloggers to your site which can result in long-term relationships and mutual coverage. Using trending hashtags is a great way to expand your reach to those outside of your community. I use Google Plus Explore to dig deeper into possibly related hashtags to target. Ann Smarty is the Brand and community manager at Internet Marketing Ninjas, founder of MyBlogU, co-founder of ViralContentBee and a serial blogger.